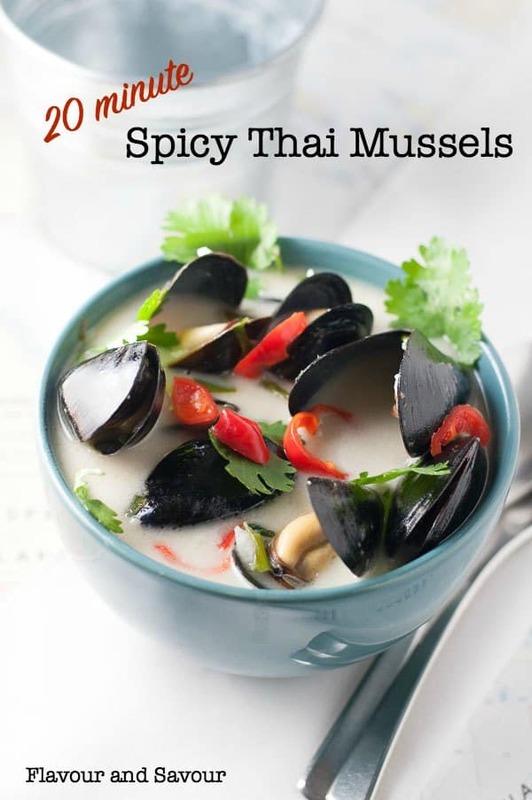 Fresh spicy Thai mussels steamed in an aromatic coconut broth make an impressive starter. 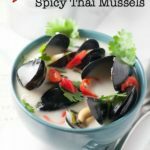 These spicy Thai mussels are an easy starter that you can make in less than twenty minutes. Steamed in aromatic coconut broth and seasoned with lemongrass, they make a showstopper appetizer. Mussels have a mild flavour and no “fishy” taste that some people shun. Make them as spicy or as mild as you like by varying the amount of chili pepper. Whenever I cook mussels, we remember an unforgettable lunch in a sunny seaside café in Toulon, in Provence on the south coast of France. 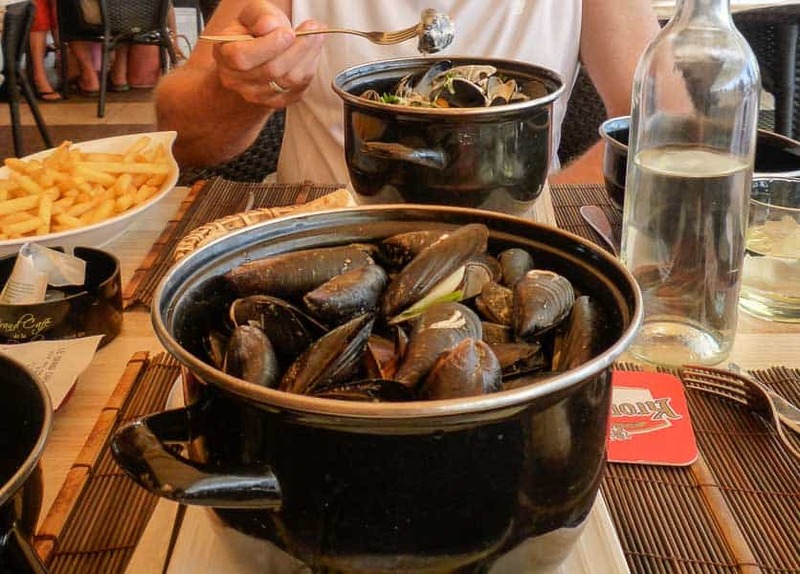 Moules et frites, (mussels and fries) is a popular menu item in France and Belgium, especially in the coastal towns where the mussels are freshly harvested daily. Serving sizes are huge, often one and a half kilograms. 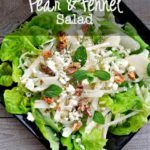 They are usually cooked in a white wine broth, with a variety of seasonings like shallots and garlic, and sometimes with Asiago cheese. They’re always accompanied with a large side of fries for dipping into the sauce. That lunch, feasting on mussels in the warm Mediterranean sunshine, is one I’ll always remember! We have our own Provence right here on Vancouver Island, however, and fresh sustainable seafood is readily available. We sometimes like to start a meal with a seafood appetizer, like these Gin-gingered Prawns, Bacon-Wrapped Prawns , or this fabulous Shrimp Salad with Grapefruit and Mint. Denis picked up some freshly harvested Saltspring Island mussels at our local fish monger yesterday. He bought a bag of 20 mussels for $5.53 and we made this fabulous starter dish. Is this Spicy Thai Mussels recipe complicated? Simply soften the flavouring ingredients in a little oil, add a can of coconut milk and a splash of fish sauce, toss in the mussels and steam for 4 to 5 minutes. Serve with a glass of chilled local white wine, a bowl for the empty shells and some crusty bakery bread for soaking up the sauce and you have the beginnings of a memorable meal! Mussels are shellfish. To prepare them safely, cook them (preferably) on the day you buy them. Keep them chilled in the fridge, covered with a damp cloth so they don’t dry out. Be sure to discard any mussels that are open or that don’t close when you tap the shell, as they are dead and are not safe to eat. Keep the mussels chilled until you’re ready to add them to the broth. Watch this short video on how to clean, debeard and store mussels safely. Scrub and debeard the mussels. Discard any that aren't tightly closed or that don't close when you tap them. Slice the onions, remove the tough outer leaves of the lemongrass stalk and cut it into short lengths. Mince the garlic, remove the leaves from the cilantro stalks and chop the stems. Heat the oil in a heavy bottomed pan. Add the onions, lemongrass, garlic, and cilantro stems and cook, stirring until softened but not browned. Add the coconut milk and fish sauce to the pot. Bring to a boil. Add the mussels all at once. Cover the pot and steam the mussels for 4-5 minutes until opened. 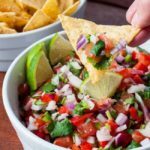 Ladle into bowls and garnish with a squeeze of lime juice and some fresh cilantro leaves. Serve immediately. Thai red peppers are very hot. You may wish to wear gloves when handling them. 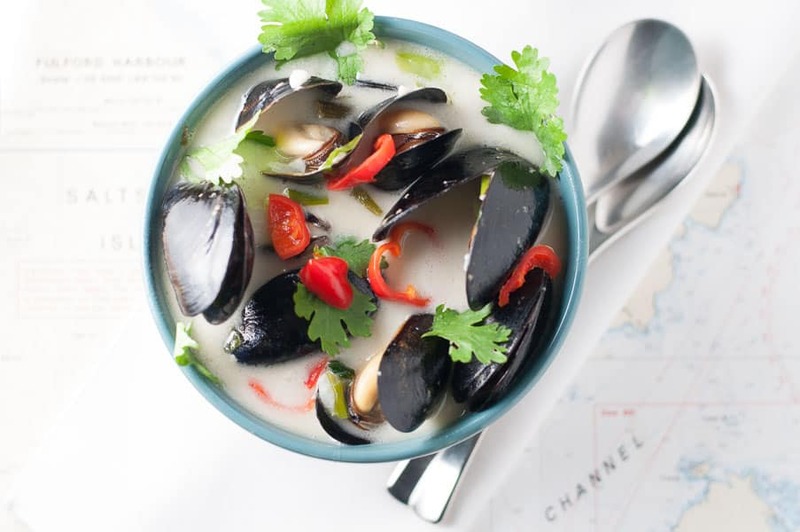 This recipe has been adapted from Jamie Oliver’s Thai Mussels. I adore mussels. Why don’t I make them more?? Thanks for the inspiration! I ask myself the same thing! 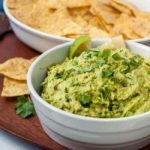 They’re quick to prepare, inexpensive, and delicious. great looking mussels dish! 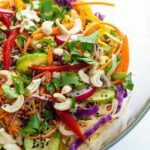 we have recently relocated to Thailand and are looking to experiment with some local Asian and Western dishes! Thanks! That’s exciting news! I’ve just subscribed to sprinklesandsauce so I won’t miss any of your creations.